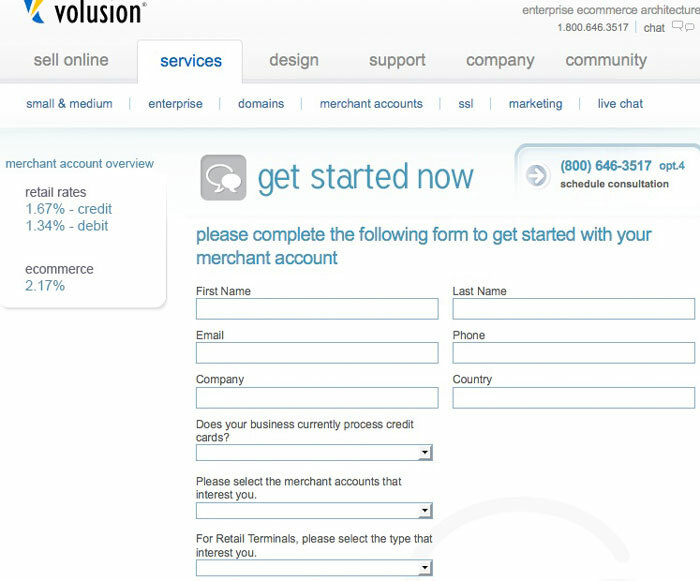 will you save with volusion merchant account? 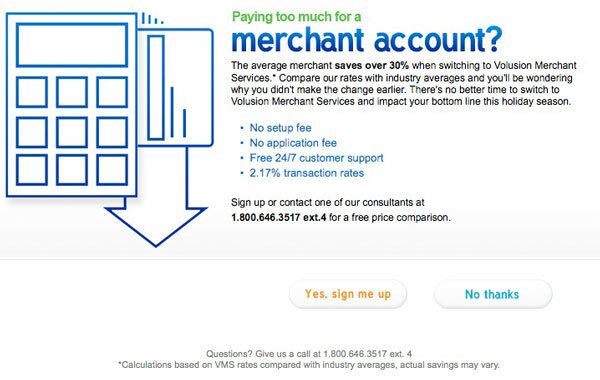 A review of a new Volusion ad for merchant accounts reveals the truth and hidden information about merchant services. I thought my web store CEOgolfshop.com was highjacked when I went to my admin page and all I saw was an ad for merchant services from Volusion. I hit reload. I checked the URL I was at, and yep, it was my web store. But it was my admin page, not my public home page and they interrupted my ‘home’ page with their ad for a Volusion merchant account. It’s actually a pretty compelling ad. I’ve used Volusion for several years and if I wasn’t in the merchant services business, I’d definitely call or click through. Since I am in the business, I clicked through and here’s what comes next. Here’s why I don’t like this advertisement and you shouldn’t be enticed this or any similar ad. We all know there isn’t one low rate for everything, right? They capture a bunch of information about your company, and you have no details at all about the deal. Not only that, but it isn’t any where else on their web site. If you read my web site, you’ll find lots of information about interchange rates, the real truth about the merchant account application and underwriting process and lots of other insights so you can make an informed decision before providing company details. Beyond my personal annoyance, let’s look under the hood at the offer. What? There is no information? Fortunately, I’ve already been through the details of their merchant account offer before, so I’m familiar with more than what’s posted here. However, if you look harder, there is more information on the web site, they just don’t provide any links to it from the ad or sign up form. As of this writing, they are using Global Payments Direct, Inc. as their merchant services partner provider. Global Payments Direct is a publicly traded independent services provider GPN :NYSE). Current assets are down, intangible assets are up significantly compared to other years and debt is up 50%. But I digress as all of that is irrelevant. The retail rates quoted have nothing to do with your Volusion merchant store. Retail rates only apply to card present transactions, and the customer must sign a receipt. Will you save with a volusion merchant account? There’s no way to tell based on the information provided. You will not be getting 2.17% ecommerce as a flat rate. They do explain on their site there is a $.27 per transaction fee, gateway fee, statement fee, etc all pretty standard stuff. But what you don’t know is, what transactions will qualify for the 2.17% ecommerce rate? Is that for debit cards? With debit interchange for ecommerce at 1.55% plus $.15 per transaction, that’s 63 basis points profit. Now I don’t know if that’s what they are referring to, but if you have a sizable business, please call me and you’ll save real money! I can’t imagine this being a good deal for anyone but small businesses with under $50,000 per year. What is their rate for rewards cards, which represent usually over 40% of cards presented? If you authorize, but don’t capture on the same day, it’s highly unlikely you’ll ever pay that rate, but will probably pay 20-70 basis points more or .20% to .70% more. See also my article review of Volusion merchant accounts 101. In conclusion, you can’t tell from their ad, but in all likelihood their solution is as good as any if you have a very small business with under $5000/mth since it will be easy to implement. However, be sure to read the fine print. Is your business expected to grow? What are the penalties for switching to another provider if you are unhappy with rates later ? This entry was posted in ecommerce, rates and tagged ecommerce, merchant account, rates, volusion by cspeedy. Bookmark the permalink. Thanks for this article. I’m a potential Volusion customer and I’ve been looking to go with their merchant services. You bring up some good points, however, I’m trying to compare Volusion’s rates with your rates. I can’t find any where on your site where I can find your discount rates and fee schedules? Can you point me in the right direction? They are not posted because customers get pricing based on their volume, not the same rate for everyone. Most customers are large enough they get wholesale pricing, that is “interchange” plus a merchant discount of “some” basis points. Interchange rate links are found in “pages” link in the upper right blog nav. You can click through to the Visa & MasterCard sites to download the latest rates. You won’t see this type of cost breakout with Volusion- prices are ‘bundled’, which is common for small businesses. If this is your first merchant account, you can fill in the form as much as possible, including projected sales volume in the comments area, and I’ll email you my recommendation.